East River Ferry. Image credit: NYCEDC. NYCEDC seeks less cumbersome process to meet the needs of increasing ridership on the East River Ferry. On March 4, 2014, the City Council’s Land Use Subcommittee on Zoning and Franchises voted 7-0 to approve an application submitted by the New York City Economic Development Corporation (NYCEDC) to amend portions of the Zoning Resolution regulating ferry and water taxi facilities along the Williamsburg Waterfront in Brooklyn. The proposed zoning text amendment makes way for increased East River Ferry service, which was established as a three-year pilot program in 2011 by the NYCEDC. The East River Ferry offers daily Brooklyn-Queens inter-borough transportation and Manhattan connections for commuters and recreational users. On December 13, 2013, former Mayor Michael Bloomberg announced that the East River Ferry, which was scheduled to terminate in June of 2014, will continue providing services until at least 2019 pursuant to a contract for a five-year extension. The City Planning Report states that the proposed zoning text amendment seeks to establish a non-discretionary certification process with the City Planning Commission Chairperson to increase the capacity of ferry vessels permitted to dock in R6-R10 Residence Districts, as well as all Commercial and Manufacturing Districts as-of-right along the Williamsburg Waterfront. 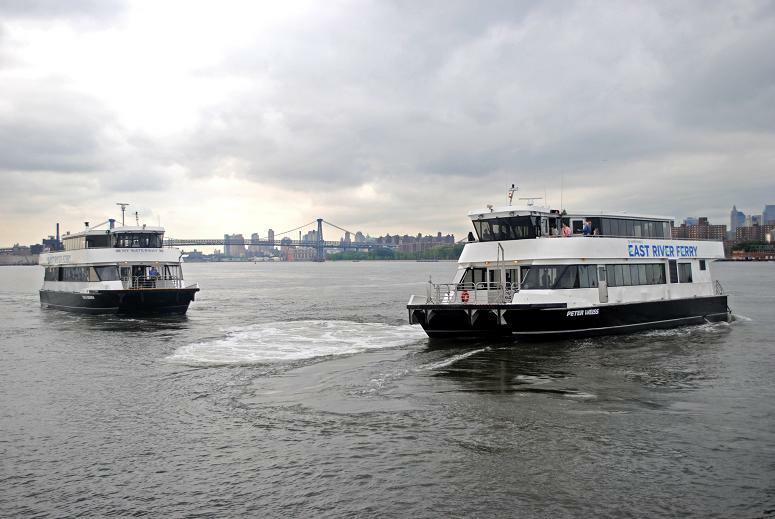 This certification process is intended to allow the NYCEDC to better address the needs of increasing ridership and operational needs of the Easy River Ferry. The proposed certification would also waive parking and drop-off/pick-up requirements, and would require that the NYCEDC meet site design standards to ensure harmonious interaction between ferry docks and waterfront public access areas. The proposed zoning text amendment would affect all waterfront zoning lots within Brooklyn Community District 1, which are located within Williamsburg and Greenpoint in North Brooklyn. The waterfront zoning lots located within Williamsburg generally span the area between the Brooklyn Navy Yard and North 15th Street. Greenpoint waterfront zoning lots span the distance between North 15th Street and the south edge of Newtown Creek. The existing zoning regulations limit size of ferries at three of the existing dock locations and authorizations are required in other docks. Current landings provide no parking, and there are currently no site design standards. Presently, there are vessel capacities of 99 passengers for water taxis and 150 passengers for ferries per half hour by special permit, and as-of-right for commercial and manufacturing districts. During the March 4th Zoning and Franchises public hearing, Zachary Smith, Chief Operating Operator of NYCEDC, said that the pilot ferry service on the Williamsburg waterfront “had to overcome major obstacles in the existing zoning regulations” to meet higher demands for ferry service, including special permits and temporary mayoral overrides. For example, during the 2011 summer season, in order to meet the needs of significantly increased ridership, the NYCEDC sought a Mayoral Zoning Override to permit 399-passenger ferries on summer weekends in the Greenpoint, North Williamsburg, and South Williamsburg landings. Council Member Daniel R. Garodnick asked about circumstances under which mayoral zoning overrides are permitted, and stated that he and other council members would inquire further into mayoral zoning overrides. Local Council Member Stephen Levin expressed support for the application and the East River Ferry, stating that “it’s been a great amenity to the constituents in my district.” Council Member Levin, however, urged the NYCEDC to conduct thorough and regular inspections of all ferry landing docks, particularly in light of a collapse of a ferry ramp on the India Street dock in Greenpoint, Brooklyn on February 13, 2014. Noting that the L-train currently has the highest ridership in the City with a capacity that is “unbearable at this point,” Council Member Antonio Reynoso commended the ferry service for providing “extremely important” alternatives. Council Member Reynoso also asked the NYCEDC to reconsider projections and capacity for bicycle parking. Brooklyn Community Board 1 voted 27-1 in support of the application on December 10, 2013, with the condition that the text be modified to include illuminated shelters within 100 feet of the boat docks and upgrade any lighting that does not meet the City’s current safety standards for areas of public usage. Former Borough President Marty Markowitz recommended approval of the application on December 10th, with the same lighting requirements requested by the Community Board and requested that signage indicating ferry schedules and routes also incorporate contact information for the entity responsible for site maintenance. The City Planning Commission unanimously voted on February 5, 2014 to approve the application. Following the Subcommittee’s vote, City Council’s Land Use Committee laid over the application on March 6, 2014. City Council: East River Text Amendment (N 140099 ZRK – Zoning Text Amendment)(March 6, 2014).